Amazingly, in this abbreviated, punctuation-challenged, acronym-littered world, some spelling mistakes — especially in public spaces — still get people riled up enough to want to fix them. Take Jeff Deck, a writer and copy editor. “A sign in my neighbourhood [‘No Tresspassing’] had a typo in it,” he says. So he and his friend Benjamin Herson grabbed some markers, chalk and correction fluid and scoured the U.S. to find and correct as many typos as they could. Then they wrote about it in their recent book, The Great Typo Hunt. 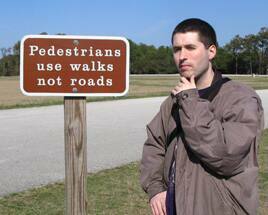 The authors focussed on mistakes made by native speakers of English, on signs in public view. 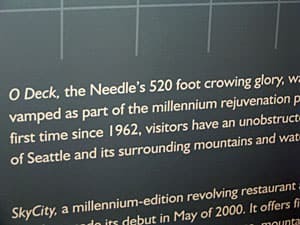 For instance, the sign at the Space Needle in Seattle brags how the building is Seattle’s “crowing” glory. Oops. Eating crow, indeed, over a missing “n”. Aside from the addition or deletion of the rampantly misused apostrophe, the authors found all manner of misspellings. For instance: restuarant and restarant, hellicopter (which promises a rather hellish ride), Thrusday and meterological missing the first “o”. That one was engraved into a sign at a federal courthouse, victim to the age-old struggle with vowels and double letters. Beefstake tomatoes and sweet papyas were found lurking in grocery stores. The proud Milwuakee Furniture people unfortunately misspelled their own namesake, and the Dream Jamb Band was clearly waiting for its own jamboree. You also have to wonder how successful this sign could be: Lonley? You got a friend in booze. And let’s not forget the misspellings pregnacy test and Atlanta souviner — on the same sign, no less. Overall, the guys found more than 400 typos, and were able to correct about half of them. Why bother, you might ask? It’s not like these mistakes are causing traffic jams or riots. “In a lot of cases, typos will actually not interfere with whatever someone is trying to communicate, but there’s still damage being done,” says Deck. Deck says that is especially the case with small, independent businesses that don’t have the editorial resources of a large corporation. One analysis last year claimed that poor spelling is costing Britain’s internet businesses millions of pounds in lost revenue, and that a single spelling mistake can cut online sales in half. People just click off the website. I thought that analysis might be overstating things until I came upon an online profile, written by someone I’ve done business with for a while. The spelling was atrocious. It flummoxed me because she’s such an articulate woman. But as I read, I could hear the click, click, click as my impression dropped a few notches. I didn’t want it to — it just happened. Maxine Ruvinsky says spelling errors also hurt the credibility of newspapers and books. She’s the author of Practical Grammar: A Canadian Writer’s Resource and teaches journalism at Thompson Rivers University in B.C. There are all kinds of reasons why. Newspapers are outsourcing editing or having copy editors do more than just detect errors. Then there’s the fact that we rely so much now on spell-check, which automatically corrects our documents and makes us a little less fastidious. When you think about it, we’re actually rewarded for spelling incorrectly. Ever notice when you Google a word that’s misspelled (like Caribbean), it’s automatically corrected? Ruvinsky, though, says we’re still living with the effects of the whole language movement, which teaches students to look at the whole word for meaning, rather than breaking it down into its components, a system that puts more attention on spelling. She also says we can get young people to care more about spelling simply by getting them to write more. For now, when you see a mistake on a sign, menu or other public space, should you fix it? Typo Hunter Jeff Deck says it’s OK to want to correct something, but don’t just scrawl on every sign or poster that has something amiss. Go to the source. That way, you can prevent future mistakes. That strategy helped Deck in a popular tourist area in South Carolina. He noted that the word sweatshirts had been abbreviated to “sweats” with an extra “t”. So he went in and asked to fix it. As for fixing a Twitter typo, well, many argue there are no spelling rules in the Wild West of social media. But that may depend a bit on who you are and what message you’re trying to get across. When Treasury Board President Tony Clement recently used the word “tonite” in a tweet, a teenager tweeted back that if he can’t spell properly, how can he run a government department? The minister may have just been trying to be social and tweety, but it would seem that if you make a high-profile spelling slip, you could be shooting yourself in the foot. Many thanks for reading! I’m glad you enjoyed it. Language is a lifelong passion and I’m happy to share my insights with other language lovers. I just like the valuable info yoou provide to your articles. new stuff right right here! Best of ljck for the next! Hello! I could have sworn I’ve been to your blog before but after looking at some of the articles I realized it’s new to me. Anyhow, I’m definitely delighted I found it and I’ll be bookmarking it and checking back often! Thanks for checking it out. I’m glad that you’re enjoying the columns!